You know how they say your life can change in a moment? Well, just over 30 years ago I walked into a room in the Ministry of Agriculture in the southern African country of Malawi. I had come to collect some agricultural data. I opened the door and there was a young woman, with dark curly hair, a bright yellow dress and a beautiful smile. She gave me the data, but soon our conversation turned to tennis. That weekend we hiked Mt Mulanje in Malawi, and two years later we were married. Her name was Melitta Alevropoulos. One day, in 2012, I came home from work and Melitta said to me: “Bad news, I went for my smear test and the doctor says I need an emergency hysterectomy.” She had the operation, went through chemo, radiation and then, a few months later I got a call from her. I was travelling for work, in East Timor, on the other side of the world. I was sitting in an office, working, when Melitta called and told me “Bad news, the cancer has metastasized, they say I have 12-18 months to live”. Her voice was so far away, I couldn’t see her face, I couldn’t reach out and touch her hand, I couldn’t tell her it would be alright, I couldn’t make her smile. I sat down and cried. For her, for the graduations and weddings she would miss, for the grandchildren she would never see, for our children and for myself. She died two years later, in the living room, surrounded by her family. That morning she had smiled for the last time. She was just 53 years old. It doesn’t have to be this way, cervical cancer is the first cancer which can be eliminated, through HPV vaccination and good screening. Progress has been dramatic in the past few years, at least in richer countries. Although there are some other countries like Rwanda where HPV vaccination has been rolled out to reach virtually 100% of girls. The main barrier is awareness – and political leadership. And resources, in poorer countries – although the HPV vaccine is listed as one of WHO’s few “best buys”. Inspired by Melitta, I wanted to do something which would honour her values of making a difference. So I am walking the 3,500 miles of the coast of England and Wales, taking a year to walk around 10-12 miles each day. To raise awareness that we can eliminate cervical cancer. All funds raised go to a Cancer Research UK-supported researcher who’s identifying ways to raise awareness about preventing cervical cancer. I started near Brighton in June and, so far, I’ve walked along the south coast, round Devon and Cornwall and am now in south Wales. 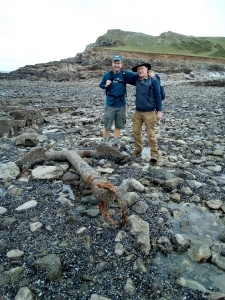 I was delighted that Stephen Lister, his 8-year-old grandson Jacob and Jacob’s dog Sirius were able to join me for 3 days on the beautiful Gower peninsula. We had a lovely time. And we did some serious walking: Stephen mentioned that it was the first time Jacob had walked two full days consecutively. So my request to the Mokoro family is: talk to your loved ones about cervical cancer, and how it’s preventable with vaccination and screening. And when advising governments on their budgets, help them ensure there are enough resources for preventive care in their health budgets. Let’s keep the women we love in our lives. My website, where you can find out more about my walk and about eliminating cervical cancer, is www.3500toendit.com.